National Heart Institute is a fully accredited cardiac health care and teaching facility affiliated with the IGNOU. We are dedicated to discovering and delivering the best patient care, teaching and research. Dr. Yadava met Mr. Harish Rawat Honorable Chief Ministerr, Uttarakhand on the 13th of July. Dr. Yadava give a presentation on the health problems prevalent in the state. He also discussed the probability of setting up a fully equipped Heart Centre in Base Hospital, Almora. The Hon’ble Chief Minister agreed in principle to open such a centre. Free pacemakers and ICDs are available for poor patients at the National Heart Institute/All India Heart Foundation. Those interested may contact Bhattacharjee at 9711121254. In an exclusive interview with India Medical Times, Dr O P Yadava, CEO and Chief Cardiac Surgeon of the National Heart Institute, New Delhi, spoke about how the field of cardiology and cardiothoracic surgery has developed over the years. Dr O P Yadava hails from an army background. After completing his medical graduation (MBBS) and MS (General Surgery) from Maulana Azad Medical College, New Delhi in 1976 and 1981 respectively, he joined the Armed Forces as Surgical Specialist. He cleared his DNB Examination in General Surgery in 1983. His basic training in cardiothoracic surgery started when he was at the Cardiothoracic Centre, Armed Forces Medical College (AFMC), Pune in 1985. For advanced training he went to Australia. Besides adult cardiac surgery, he was trained in paediatric cardiac surgery in Melbourne and Japan. He came back to India in 1992 and soon cleared the DNB Examination in Cardiothoracic Surgery. He has an experience of over 12,000 open heart surgical procedures, of which around 10,000 have been performed after his return to India and include mainly coronary artery bypass surgeries, valve repair & replacements and congenital heart procedures. His special field of interest is coronary artery bypass surgery especially total arterial revascularisation and beating heart surgeries (minimally invasive). Currently, he is chief executive officer and chief consultant cardiac surgeon, National Heart Institute, New Delhi and director, All India Heart Foundation, after having served as founder chairman, department of cardiac surgery, Dharma Vira Heart Centre, Sir Ganga Ram Hospital, New Delhi from 1998 to 2005. He is married to Dr Usha Yadava, Director and Professor at Guru Nanak Eye Centre, Maulana Azad Medical College, New Delhi. What is the National Heart Institute all about? National Heart Institute is the brainchild of an absolute stalwart (Dr S Padmavati). What sets National Heart Institute apart from the rest is that it is a model which is suitable for all over the country; it’s a model where the rich and the affordable class pay the full charges. The money we earn from them is channelized to take care of the impoverished. Even right now you can walk with me and see how many free cases are undergoing, not just high blood pressure in-patients but also open-heart surgeries are undergoing where patients are kept for 3-4 days in the hospital free of cost. Not only open-heart surgery but valve replacements are also being done here. The valves that are being used for the impoverished are exactly the same quality as we would have used for a paying case. You go to any hospital in the country, whether the patient is less paying or non-paying, they use Indian valve. I am not taking merit away from those Indian valves but they price less. But we are using the same American valve in all our cases, irrespective of whether they are free or not free. In fact, in one of the inspections of this hospital – the court directed the inspection by the monitoring committee — there was an objection that you don’t have earmarked beds for poor people. Even today, we don’t have earmarked beds. In our reply to the court, we mentioned that the moment we earmark that this room is for poor people, the service in that room will go down. When a kitchen knows that I am sending these five trays to room No. X, which has got poor people, they will put less food, less tasty food or they may take away something. But here, we have ethos that we don’t have any classification even today. A patient paying Rs 2.5 lakh for his surgery is in that bed today, tomorrow when he is discharged, on the same bed a free case will come, the nurse doesn’t know, the doctor doesn’t know, only the finance department knows that the patient is not paying. If you read the judgement of Delhi High Court, one of the major hospitals challenged that it will not be able to do free cases, the judgement said, “If a small hospital like National Heart Institute can do free cases, why can’t you?” We are honouring all our commitments to the society as well as the court directed commitments despite our financial conditions. What’s the vision for the National Heart Institute? Who inspires you? Somehow by nature, I am not the one who is given to eulogizing any individual. The only people I touch feet of is, probably God in the morning, when I get up, and my parents when they were alive, otherwise no man to me is great enough to threaten me or to challenge me or to excite me. The biggest thing that excites me is my own self and that’s what appeals to me or makes me feel good. I do lot of charity work in mountains, in fact, I have made my house in Almora in Uttrakhand, and we are making a small charity hospital, calledUttarayana Hospital. Currently, we are running a telemedicine programme at Uttarayana Hospital with the National Heart Institute. We are also signing an MoU with the Government of Uttrakhand for starting cardiac services at the Base Hospital, Almora in Uttrakhand where we will provide technical knowhow and manpower while the government will fund it and provide the infrastructure. We want to take it to the poor people. Many people say you are doing a great service to the humanity. Working in the heart surgery field is a very stressful job. To take a break from this stress, I used to take 2-3 days off from healthcare and go into the peace of the mountains. When people know that you are a doctor they will ask you some little advice and you would give them, that got me started doing the regular camps in those areas. When people say you are doing a service to the community, believe me I entirely do the service for my own self — I go there, enjoy environment, meet people, relax myself and they (mountain people) look after you so well. So you come back from there absolutely relaxed and refreshed. And if in between this someone gets served, that’s his good luck! But I am not trying to serve anyone; it is just for my good. So, if you say, name a person who inspires me, I would say my parents. Vision for this institute is exactly what I have said; we are not into this wild thing of opening a chain of centres; all this time so many requests come from sister institute and from here and there, come and operate here, come and operate there. No, if we operate at National Heart Institute in the morning and operate another at some other institute in the evening, then who will look after the patients here? This is all commercialization of medicine. This doesn’t serve the cause of the patient or the country or anything, where one doctor is multitasking and visiting 10 places in one go, which is happening rampantly in this country. I want to be in one place; but yes, we want to add on, not for commercial reasons to takeover hospitals, but on social front. After we established this hospital, brought it back from a place where we had huge losses and debts, built infrastructure, changed equipments, the second venture of ours is a cardiac care unit that we are setting up at Almora Base Hospital in Uttrakhand. We have also been organising monthly camps in Uttrakhand with the government support for almost last 10 years now. Virtually, I would say heart camp is held wherever people demand and the need is and that’s totally free of cost. We want to increase our outreach programme and do these kinds of social expansion rather than commercial expansion into corporate sector. What measures have been taken at the National Heart Institute for medical research? We run DNB courses at the National Heart Institute; we have DNB Cardiology, DNB Cardiac Surgery; we have also applied for DNB in Anaesthesia and in Diabetology. We are also looking at Dermatology and Sleep Medicine in DNB programme. So, with the teaching programme, teaching value is there, and the dissertation has to be written by the students. We do lot of studies in community medicine; the All India Heart Foundation, historically, has been doing this work; in fact, the rheumatic penicillin prophylaxis programme for the school health, which was adopted by the Government of India, is the product of the All India Heart Foundation. We are still looking at the school health programmes and phenomenological studies. We are doing studies in bone surgery, bypass surgery. In fact, we have fund for research, which is designated for that only. 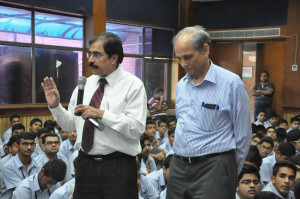 Recently, Dr Shridhar Dwivedi, who was principal of Hamdard Institute of Medical Sciences and Research and earlier professor in the University College of Medical Sciences, joined us with a view to take further research into preventive health rather than into curative, and that’s what our basic ethos are and strength is. We have also done epidemiologic studies in rheumatic fever and hypertension, which are going on in the medical side. We do give a lot of stress to research work. What has been the most important change since you joined the medical profession? Most important change has been – the private sector taking a major role in the delivery of healthcare at the secondary and tertiary healthcare levels. I am not dispiriting privatization; I am not criticizing it; I appreciate a lot of good that has come out of it, but for every good that has come out of it, there has been a lot of damage and harm come out of it too. The medical profession has lost its steam to a fair degree because of the commercialization. It’s true, the profit has to be made; if any service runs at a loss, it is unstable, whether it is in the government front or not. I don’t believe in giving subsidies, I believe in empowering a person so that he doesn’t need subsidy. It’s the way you look at a glass, half empty and half full. I believe in empowering a person so that you make him so competent, so good, so financially empowered that he can pay for his service. A lot of medical professionals say, “If a lawyer charges so much, Rs 7 lakh as his single fee, then why can’t we doctors charge Rs 5,000 as our single fee?” Everyday half a dozen of patients touch your feet and thank you. But tell me if anyone would have every touched the feet of a lawyer? You can’t monetize those kinds of privileges that you have. This corporatisation, putting targets on people that so and so number of cases have to be done, which has created a lot of problems; paying unrealistic salaries which they want to be delivered in terms of the number of work you bring in; if an individual is unable to bring, either his salary is cut or you force an individual to bring more work on false grounds or unethical grounds. So, that’s the element of medicine which, unfortunately, is one that’s hurting. The second gross change that has been is technology has taken over entirely the delivery of healthcare. A fine balance has to be drawn where technology is needed but along with technology we must maintain our holistic nature of healthcare. Sometimes, just a gentle hand holding can give so much of assurance to a patient and wellness to a patient that truck load of medicines would not be able to provide. It is not that technology has to be discarded; the two has to be amalgamated into one single. Even other fields of medicine, we can’t do much for asthma, but Homeopathy and Ayurveda can’t do much for acute appendicitis or a broken bone; can’t the two (modern and traditional medicines) meet and deliver healthcare under the one roof? We, at the National Heart Institute, have started a homeopathy programme where a consultant of homeopathy is available. In Uttrakhand, we even have a faith healer with us, who in Dina Hospital earlier used to be a part of the team. You can make a small Mandir within the hospital; see how much of strength it gives to a patient’s relatives, praying when their patient is getting allopathic treatment under the same roof. Do you see a way out? Oh yes, why not? In fact, it is already there. If you look at the western world today, they are amalgamating. In their medical teaching, ethics were not touched at all but they have started talking of it nowadays. In the medical school teaching, it is a subject which is taught. If you look at science also, quantum physics today talks of science and spirituality; when physical medicine started two and half centuries back, René Descartes said that everything is with reason and logic and physical. Today, quantum physics has said that spirituality and science are meeting at a common point. Today, both are converging, not diverging. We were diverging for 200 years but today we are talking the same language. Everything that spirituality has said is now being proven by science. It’s time when the two has to be amalgamated and we are working towards amalgamation. All top and high level scientific researches are working towards that. Ever since the ancient times, we are working towards the convergence and not divergence. Deepak Chopra and Larry Dossey – these are the big names in the medical field in international arena. They all are working towards this. With all respect to Ramdev jee, all he says is correct but that 10% of gibberish which he talks — I am sorry, I am using a wrong word for a very illustrious name — but when he says, “I will cure cancer”, or, “I will open a blocked artery”, no, you can do a lot of good things, 90% of what you say is fine, but I tell my patients, please get a bypass if your arteries are blocked, or an angioplasty, if need be, along with that. The two have to be amalgamated. There are lot of treatment modalities in Unani, Siddha, and Ayurveda, which is so good. I have never in my life taken anything else than Tulsi, Adrak and Vanaksha for common cold. I don’t take all the medicines, which sometimes I write to my patients. That’s what we need to do, create holistic medicine for future. A lot of resistance we find in medical profession to this amalgamation; I know the IMA’s stand is against this but I defer to them. They are talking of community medicine, the BSc programme in medicine, the three-year course for rural, that it should not be done, no, it should be done. It is meant for an area where there is nothing. If you give them a three years educated person, it will be much better than having nothing. It may not be as good. Limitation should be taught to that person, that you can go so far and no further. They should not be allowed to do open heart surgery. But not to be able to give health education of primary care and resist the BSc programme, it is, I think, self-defeating. I don’t think MBBS doctors with five-year course will be challenged by these doctors. No, this is the workforce for the community good, they are very much needed and they are needed in an area where MBBS doctors are not willing to go. So, I think, we are working towards this amalgamation. You started your career from Armed forces and later moved into the private sector. Please tell us something about your experience with the Armed forces. Armed forces made a man out of me. I was a boy when I joined army and it made me a man. In fact, everyone has tenure, 1st bulk your school, 2nd bulk your college, 3rd bulk for me was Army, 4th tenure in Australia, where I did advance training in heart surgery, then back in India. Out of all of them, if I had to name one, then it is the Armed forces. We learned so much there, of a different nature, as I told you, they make you a man. The tenets that they inculcate in you of discipline, of being upright; I think still Armed forces has been unsullied, to a large extent, from the degeneration in the society that we see all around in our civil society. For me, that was not a new tenure because my father was an Army officer, I am son of a gunner, he was an artillery officer, I had known Army what it is; I enjoyed Army and I liked it. That’s why after my MS, I joined Armed forces as a surgical specialist. The tenure was just fabulous and most enjoyable. Any particular incident or experience from your tenure at armed forces that you would like to share? There were many such incidents where we were taught how to conduct with the society. Those are the things I have learned from the Armed forces. How has been the field of cardiology and cardiothoracic surgery developed over the years? We have gone by leaps and bounds. A lot of credit for this development I would give to my cardiology colleagues because they are the ones who gave the impetus. We developed a lot of technologies in 1950s, 60s and may be even 70s, but then after 1975, we found that the pace of development in cardiac surgery virtually came to a standstill. We were the undisputed kings of the heart because there was no treatment for any disease on medical front. Anything which happened, including high blood pressure, diabetes, you get medicine, patient was never cured. If he had any heart problem of valves or hole in the heart or blocked arteries, everything has to be dealt by a surgeon. So, a cardiologist was very handicapped and he was always subservient to the surgeon. But then in 1970s, they worked hard and developed percutaneous technologies, and they perfected them over the 80s and 90s. Then suddenly, in mid-90s, cardiologists started taking a lot of chunk of surgical work, and that’s the time surgeons suddenly woke up and found that they are threatened. Then cardiac surgery once again started evolving. There was a lull in 1970-80s, until mid-90s. Then surgeons said that they (cardiologists) are challenging us; the same blockage that we opened by doing open heart surgery and kept the patient in hospital for 10-15 days and on bed rest for 8-12 weeks, the cardiologist will open it with a balloon, angioplasty, and keep the patient in a hospital for three days, and he would be back to work in a week’s time. So, we were threatened. Then we started developing endoscopic technology, minimal invasive surgeries, which we would do through small hole, patients are kept in hospital for 3-4 days, and then they go home and start working in three days. We started developing off-pump techniques that we would not go on the heart-lung machine that the damaging effect of the heart-lung machine does not take place and we can do this procedure off-pump. All these new developments took place during 1995 to 2015. Once again there is a flurry of activities – we now have robotic surgeries, small incision surgeries; we are now seeing some surgeons even at end-stage heart failure, lately for last year and a half we have seen so many heart transplants which earlier, for 20 years, we didn’t have those. How telemedicine can help in better healthcare management and what are the bottlenecks? Telemedicine in India would be important because somehow we find that mobile telephony seems to have percolated in this society deep inside. In Uttrakhand, I go there in remotest of remote areas, we have done camps there, in fact we did one camp at a place called Supi, this is about the second last habitat village on the India-China border. So, it is deep inside. After Supi, there is one more village which is about one and a half kilometres and after that it’s all forest, high mountains and snow and then China. There is no road and you have to walk to these. In those remote areas, we did a telemedicine link up with the National Heart Institute where we were seeing patients, doing the ECGs, the ECGs were transmitted here, and reports and treatment were given; we were prescribing drugs from here. We could not do echo, because the permission for it unfortunately could not be given due to the PNDT (Pre-Conception and Pre-Natal Diagnostic Techniques) Act, but earlier we had done echo also. So, telemedicine, somehow, is now the most easy thing to establish anywhere because we don’t need anything, everything is existent. It can be used for prevention of disease and health promotion. We can use these activities very aggressively; we can also use it for a lot of mobile-based applications to educate the public. Today, if I am struggling for something on my mobile, even a child from remote area comes and says, “Uncle, let me help you”. He takes it and does something and gives it back to me. I can’t handle it, which he can. So, mobile-based applications can be circulated about blood pressure, about health promotion activities. We can collect all the queries and all the data can be transmitted to a doctor who can answer. Today, by using mobile phones you can not only talk but see each other through video calling apps and get connected. Small village hospitals can be connected to major hospitals through telemedicine and they can transmit pictures, a technician can put a probe on the chest, and we can interpret images in the tertiary care hospital and tell this is what has to be done. If you talk about bottlenecks, the legality involve in telemedicine advice is critical. If something goes wrong then what will happen? The ethical issues, the moral issues, till what levels the telemedicine practice should be done and beyond which level we say ‘now you transfer the patient’. Those nitty-gritties have to be established. Whenever you do a new thing, you will find problems there, new issues will pop-up, and it may take 5-10 years to stabilize the technology. So, has it stabilized? The answer is no, but it is being done. A lot of intensive care units of major hospital chains have been connected. Dr Devi Shetty is doing that, Apollo Hospital is doing it, KGMC in Lucknow is doing it. I told you how we in a small village hospital linked up. A non-technical person can record the blood pressure and tell us and we can interview the patient online and then send advice which can be transmitted and the print out can be taken by the technical man or a non-technical man and hand out to the patient who can go and buy those medicines. It saves the time, travel effort and expenditure for the patients. What are the reasons of the troubled doctor-patient relationship in present times? This is a difficult question because medical professionals should not be seen dissociated from the society. We are a part of the society and whatever degeneration you will have in the society there is no way you will not have it in medical profession. If there is corruption there, there will be corruption here. If I have to pay Rs 2 crore to buy a seat for post-graduation in a medical college or Rs 60-90 lakh to buy an undergraduate medical seat, the doctor will have to legitimate, it is his birth right to recover that amount from the industry. In anything, if you have invested in making a shop, you would like to recover that money. It is legitimate. When I studied, I paid fees of Rs 360 a year in Maulana Azad Medical College. I have no pressure of recovering that fast. There was no loan. Today, when students are coming out of a medical college, they already have a loan of over Rs 60 lakh after graduation and after post-graduation it reaches to Rs 2.5 crore. Then that man has to earn. So, the ethical practice goes for a six, right on the day one. Medical profession will only improve when the general society sees an upgradation of its values, and of its systems. If we try to correct medical profession as a standalone, the answer is clearly no. Regulation is not the answer. It is the moulding of the society, which has to be done. We need to start at primary level. If the education at primary level is good, those new generations which will come would be of good nature. The current new generation is certainly better than my generation. The mess of this country today is not because of the generation before me, they were good, the generation after me is also good, it is our generation which has done the damage to our society. In terms of all of these, we have not considered sustainable development, today every child is talking of green movement; it is my son who is a Rhodes scholar in Oxford University today, who castigated me, “Dad, what was the need for you to buy the Mercedes?” Today, I say shamefully that I have a Mercedes. He says, no I shall not buy a car. Rhodes scholar is not a small thing. He is a gold medallist from the National Law School, Bangalore. He used to ride a bicycle for one year when he was working under Ravindra Bhat in Delhi High Court. When he went to Oxford, he gave his bike to the peon in the court who used to ride his bike from Khanpur, South Delhi because the peon’s bike was old and damaged. He was recently back on a break of 10-15 days, and he made us dig a pit behind in the back lane to put all our bio-medical waste there and has changed us. My elder son is in Scotland doing his surgery. When he comes, he goes over to remote places and does healthcare camps. He asks specifically, I am coming for 10 days and I want to do camps in these areas. When I meet their friends, they all support these activities. The next generation, believe me, is going to take the country forward. Just follow your passion, don’t emulate anyone. Just answer your inner calling. Do whatever you want to do if it makes you feel good. When you do anything wrong, believe me even today I do many things wrong, it hurts you. That’s it. That night, you will feel it that today I did this. That’s my advice to my youngsters. Live for the day! 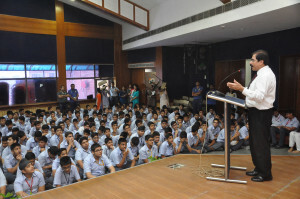 Seeking to inculcate healthy lifestyle among the youth and raise awareness about coronary diseases, city-based National Heart Institute (NHI) today kicked off a year-long outreach programme, as part of which it will target at least one school in Delhi-NCR per week. "The programmes are aimed at raising awareness on prevention of heart diseases in the early years of life, given the unhealthy lifestyle of a majority of the population today, including children. "At present, students of grades 8 and 10 are being trained on topics such as prevention of lifestyle diseases, personal and menstrual hygiene, and CPR," an official of NHI said. National Heart Institute is the research and referral tertiary care heart hospital of the All India Heart Foundation, which acts as a nucleus for diagnosis and treatment of heart ailments and allied diseases. The programme is being held as part of the 35th anniversary of NHI. The first event was organised today at Amity International School, Pushp Vihar and the second will be held in Amity International School, Saket tomorrow, the official said. "The institute will be organising school education programmes in one school in Delhi-NCR every week for the next one year, as part of a massive effort to raise preventive health awareness," she said. Coronary heart disease is one of the major problems facing Indians today. The prevalence and risk of death due to a heart disease is "four times higher" in Indians than in people from other parts of the world, according to NHI. "High-stress levels due to work pressure, early smoking, drinking, and unhealthy eating habits are all responsible for the early onset of heart disease. Earlier, heart disease was only prevalent in people aged, above 40-50 years but today those as young as in their late 20s and early 30s are falling prey to this disease. "Children in their school-going years are very receptive and vulnerable and therefore, this is the right time and age to educate them on such issues and how to prevent them. The school education programme is the first step towards this," CEO & Chief Cardiac Surgeon, NHI, Dr O P Yadava, said, on the occasion. Though there exist risk factors in the population of other countries, they have been able to slow this pattern by incorporating lifestyle changes and eating healthy. However, this cannot be said of a developing country like India, the Institute said. 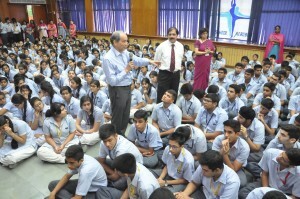 In order to commemorate the total 35 years of medical excellence & commitment to the delivery of ‘Quality Care’, the National Heart Institute (NHI), research and referral tertiary care heart hospital of the All India Heart Foundation, will be organising school education programmes in one school in Delhi National Capital Region (NCR) every week for the next 1 year, making it a massive effort on raising large-scale preventive health awareness by the institute. Due to increased risk of heart diseases in young people, the need of the hour is to increase awareness about heart diseases from a young age. The school programmes have been organised as young minds are comparatively much more receptive to any new learning. The importance of leading a healthy life right from childhood needs to be integrated in the school curriculum. On August 17, the second event will be organized in Amity International School, Saket. Aimed at raising awareness on the prevention of heart disease in the early years of life, given the unhealthy lifestyle of a majority of the population today, including children. Dr. Yadava awarded the prestigious Dr B C Roy Award for excellence in the field of medicine on Friday.